Killswitch Engage are sort of one with (non)drama. Hang on, the explanation is coming. Despite original vocalist Jesse Leach leaving in 2002 after the band’s seminal second record, Alive Or Just Breathing, due to very personal issues, never once were his friendships with his bandmates fractured. This was very much evidenced by guest appearances alongside replacement Howard Jones and collaborating with guitarist Adam Dutkiewicz in Times of Grace. Then, when Jones left in late 2011, a similar thing happened. It was amicable and tactful. In other words, no excrement was flung across the room. So now it’s 2013, Jesse Leach has returned after being a decade away. Exiting almost immediately following the release of Alive or Just Breathing meant that he never saw the band’s breakthrough into the mainstream and become the much imitated force that they are in modern metal. In many ways, it’s like the return of the prodigal son. However, a lot has changed in the time since his departure and the release of this long-awaited new record, Disarm the Descent. It’s an album you can call many things but AOJB Pt.2 is not one of them. 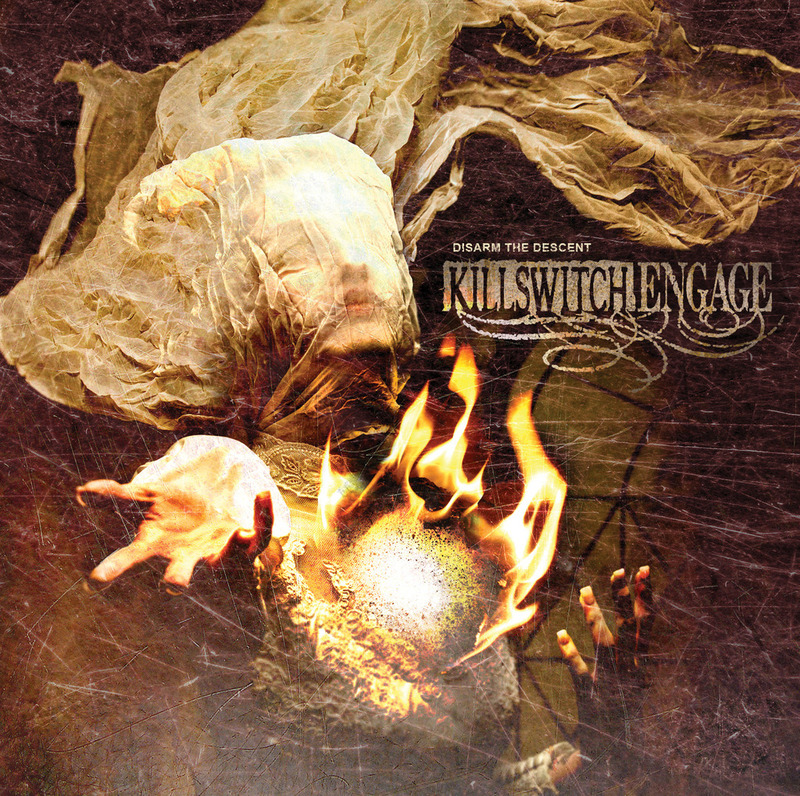 One of the criticisms levelled against Killswitch’s self-titled album in 2009 was that the certain flair and emotional depth that characterised The End of Heartache just wasn’t there and that the band was stagnating, becoming another face in a sea of bands that were copying them in the first place. Now with this rejuvenation of sorts, Disarm the Descent couldn’t be called lackadaisical or anything of the sort but with that said, this is an album has played it safe, staying firmly in the middle of the road and never hurling any question marks at you. Disarm the Descent is an easy-to-digest album that is peppered with impressive moments but has its fair share of filler too. Even though it takes a few cues from Times of Grace, the band hasn’t stepped outside any comfort zones despite being a very different album from AOJB, this is very much in tune with the band’s post-Heartache work. The gritty urgency of Alive of Just Breathing or the vastness of The End of Heartache aren’t seen, but credit where it’s due Disarm the Descent does strike moments of brilliance from time to time. ‘A Tribute to the Fallen’ is laden with the kind of massive hooks that you would expect from Killswitch, ‘You Don’t Bleed For Me’ hits a similar tone for memorable choruses and sleek riffing from Adam D and Joel Stroetzel, all the while ‘The Call’ is one of the band’s heaviest and most vicious tunes in years with drummer, Justin Foley, finally being allowed to lay down some blastbeats that synch perfectly with Jesse’s impassioned cries. Another worthwhile addition to the album is the presence of many guitar solos, something almost absent before. Lyrically, nothing has changed too much. Leach’s poetry is every bit as emotive and compelling as ever, penning words that grab you by the shoulders, force you to face the darkness but always strive to battle through. These are themes and words that written by anyone else would come across as contrived, or even corny, but Jesse’s mantras of hope are always affecting. Where Disarm the Descent falls down is on tracks where the band recoil into well-worn clichés that fail to ignite any fires. ‘New Awakening’, despite being pre-released weeks before the album, feels like it was picked up off the studio floor and tacked on, while ‘The Turning Point’ kicks in with a double kick drum barrage that was taken straight from the metalcore drummer’s handbook, 2007 edition. The ballad ‘Always’ seems like it was shoehorned into the album out of a sense of obligation and album closer ‘Time Will Not Remain’ doesn’t end the record on a flurry of emotional crescendos as the likes of ‘Rise Inside’ and ‘Hope Is…’ did in the past, ending Disarm the Descent on something of a bum note. If we were still throwing around ratings on this blog, Disarm the Descent would be looking at a six out of ten, focusing optimistically on the album’s strongest points, which there are still plenty of. Disarm the Descent may be Killswitch by numbers but it still serves to remind the masses of their existence, and the esteem they still richly deserve, after their lengthy absence.